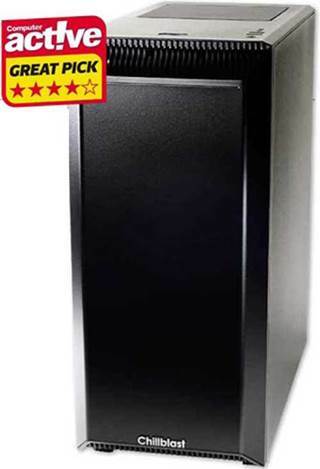 This very capable desktop PC manages to keep its top-end components cool with the aid of just one 120mm fan, which is barely audible except for a low whine when hard work calls it into action. That’s less surprising when you peek through the glass side panel of the Phanteks Eclipse P300 case and do a quick double-take as you wonder who’s nicked the PC out of your PC. This may not be a particularly big tower, but it’s a lot bigger than the Gigabyte B360M DS3H Micro ATX motherboard inside it, which sits in the top left corner surrounded by the kind of space you could rent out for a decent income in parts of London. Technically the scope for expansion is quite limited, so this void is probably never going to be used for anything more exciting than airflow, unless you choose to decorate it with strings of LED lights. Chillblast has not done that, so for the moment all you’ll see is a bit of a glow here and there. accompanied by a sensible 16GB of memory running at an adequate 2.4GHz. Overall, that means you could scrape another 10-15 percent performance out of an i7-8700K in general tasks than the Fusion Titanium delivers, but it’s not such a significant difference to call into question the trade-offs that have been made here. While we often see this processor paired with an equally unbeatable GeForce GTX 1080 graphics card, Chillblast has reasonably settled for a 1070 Ti card. With 8GB of its own video memory, it zoomed through our graphics tests, only falling behind GTX 1080 systems in 3D game-frame rates at 4K resolution. This should be plenty for both gamers and photo and video editors. There’s no skimping on the 250GB Samsung 960 Evo SSD, an extremely fast NVMe drive fitted in the single M.2 socket. This almost eliminates the tiny delays that tend to interrupt your activities when running Windows 10 from a hard drive, ensuring the PC feels fast. A 2TB Seagate Barracuda hard drive is also included to provide room for all your files. There’s nowhere obvious to put more drives, and the six USB 3.1 ports are Gen 1, limited to 5Gbps, rather than Gen 2, which is twice as fast to do justice to top-end and future external storage. This isn’t unusual, but could be limiting in years to come. Wi-Fi is an optional extra, which is still the norm with desktop towers. For maximum speed you’ll want a Gigabit Ethernet cable to your router, and that’s supported by the motherboard’s Realtek 8118 Gaming LAN interface with automatic bandwidth allocation that prioritises games and video streaming when your connection gets clogged. With so many current PC configurations favouring graphics and gaming, it’s refreshing to see a small compromise on that front producing a system that’s a true all-rounder at a fair price – even if it may not be the most future-proof. It's pricey, but you get a lot of speed and storage for the money, plus six USB 3.1 ports.